The cover is lavish, complex, and beatifully detailed. So is the story, but not without problems. Series: The second and final volume, The Folded World, has just been released. Spoiler-free Synopsis: Four stories intertwined are told. The first is of Brother Hiob, who in 1699 travels to India searching for Prester John, the mythical Christian priest-king ruling a hidden and fantastical kingdom. Hiob finds a magical tree on which books grow, and plucks down three of them to read. The first book (and our second story) is by John himself, a medieval priest, who tells of his shipwreck on a sea of sand and his discovery of Pentexore, a secluded land in the East filled with bizarre creatures, perverse philosophies, and secrets of ancient history. Our third story is by Hagia, a blemmye who becomes John’s queen, who writes in bitterness of her life before and after his coming. The final story is by Hajji, a panotti, who recounts her famous early life as nanny and storyteller to three royal children. Reason for Beginning: I bought it at Borders’ closing book sale, on the strength of recommendations for Catherynne Valente, and because I could not find her Orphan’s Tales. I also have a keen interest in medieval history and the legend of Prester John. Reason for Finishing: Beautiful writing, but also as a bit of a challenge. Valente launches an attack on Christianity in the book, and in order for me to understand it and reply I had to finish it. Story Re-readability: Low, for me, because there was too much to dislike, but going by other reviews, many people loved it. The prose is rich and worth returning to, and the story is certainly layered, with enough complexity to sustain rereads. In fact, I would gladly revisit the world of the story, for the most part. But the characters and themes were distasteful to me, and I have no current desire to return to them. Author Re-readability: As said above, Valente’s prose is beautiful, and in many places quite original, and I will be seeking out her Orphan’s Tales, which come highly recommended by dear friends of mine. But I’m not in love with her: in fact, her prose is so florid and grandiose that it nearly smothers her characters, and I had difficulty connecting with them emotionally. But much of this comes down to personal preference: I gravitate towards storytelling that seems almost unaware of its greatness, that has an element of modesty and love for its readers. The Habitation of the Blessed, in contrast, feels very much wrapped up in its own Greatness, as if it expects its readers to bow down and worship it. This tone put me off, and is one reason why I probably won’t reread it. Recommendation: My recommendation is more subjective than ever, here. In general, I will say no, because I found the story itself to be lacking in true value and Valente’s themes to be offensive and steeped in poor philosophy. Christians will feel attacked by this book, as Valente does everything she can to belittle and attack our faith at every turn, even going so far as to rewrite sections of it and then use that as the basis of her misunderstandings. I note, with some pessimism, that the reviews I have read on other sites fail to notice her prejudice. However, the world she creates is so blooming with life and creativity, and her prose so glimmering, that a good reader will find much to enjoy and learn from, even if he dislikes the things I dislike about it. 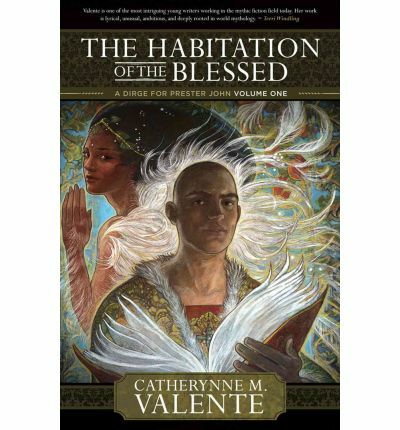 In her Acknowledgements, Valente credits the inspiration for this novel to “a very bad poem” about the titular priest-king left in her office by an anonymous student that caused her to say to herself, “Prester John deserves better.” I smile, because I can completely relate to that moment. I had many like it myself as I read The Habitation of the Blessed. Oh, I do not mean to says that Prester John deserves a more skilled proser. Valente is among the very best I have ever had the privilege of reading. She’s high-minded and down-to-earth, bold and gentle, and has qualities belonging both to the lyricists (writing surreal images of great visual and emotional power) and the chroniclers (blending myths and folk tales with history in a pseudo-historical manner). But she utterly brutalizes the man Prester John and everything Christian he stood for to the medieval people who heard his legend. It is her story and she may write what she likes, but I am not obliged to like it or agree with it, nor to accept or reject it in its entirety. ‘In Christ there is also peace,’ I said, and the angel said nothing. The above quote, between John and a creature who looks like a biblical angel (many-winged, many-eyed, song-voiced), is one of many passages where Valente sets up a false and shallow idea of what she thinks Christianity is and tears it down by way of the magical rules she invents for her world. To her, Christianity is a set of rules in conflict with what is natural, and so she uses as her Christian mouthpiece the puritanically disturbed and abused John. John meets the amazing creatures of Pentexore and becomes obsessed with converting them; not, that is, in giving them true life and freedom through Christ, but in making them say Mass and dress by his customs and build things he can call cathedrals. He is not a villain – Valente has some sympathy for all her characters, I believe, and she does a good job of portraying John’s inner struggle with the text he remembers from the Bible, what he was taught by Nestorius (who denied the fullness of the Incarnation), and what he sees before him in Pentexore. He is capable of great passion and affection, and shows tenderness to those creatures he becomes more familiar with. But as a spokesperson for Christianity, he is a poor choice, because he lacks any real understanding of the gospel. He lacks spiritual life, in fact. He is bound by the Law, and has no concept of freedom in Christ (I’ve been in the Book of Romans quite a bit lately). He tries to fight sin with rules, and falls apart in so doing. For instance, one of his great weaknesses is lust. So Valente pits him against one of the other narrators, Hagia, who is of a race of human-like people whose heads are located in their chests. This means that her mouth is in front of her heart, and her eyes are at the ends of her breasts. So John is forced to stare at her naked torso if he wishes to pay her attention; this causes him no end of grief, because he believes women and their bodies are inherently sinful, and yet he is overcome with lust for her. Talk about a shallow misunderstanding of Christian notions of sexuality and modesty! Yet Valente uses him to represent Christianity, and seems to take his ideas as mostly representative. Well, not completely representative. To be fair, she has two other Christian characters who are far more sympathetic. Brother Hiob, whose tale is the frame in which the others are set, is obviously a kind and good man, much more wise and healthy than John. But his faith is easily shaken by what he reads in the memoirs of John, Hagia, and Hajji. His goodness seems to be in spite of his faith. The other character is Thomas, also called Doubting Thomas, the apostle. His part in the story is small, but vital. John learns that after Christ’s crucifixion, Thomas left for the East and discovered Pentexore. Initially disturbed by the bizarre creatures and their ways, he nonetheless responded with love and charity, marrying one creature, settling down, and finding a way to synthesize their strange world and morals with his own understanding of Jesus’ teachings. For the most part I liked him as a person – he obviously understood that love and relationships are more important to God than rules. But she has Thomas be Jesus’ twin brother and offer an account of His life that is similar in some respects to the gospels, but just different enough to miss the point. On the one hand, Valente does not contradict His miracles, or His prophesied birth, or His perfect wisdom and love. But she leaves his identity in some mystery, and suggests that even if He is the Son of God the Father, then the Father is probably different from what Christians believe. I also disliked the handling of the Pentexoran characters, even though I have great admiration for how Valente could portray such fantastic creatures with such down-to-earth, human-like personalities. Now, just because the characters are unlikable is not reason enough to dislike a story – Matt Schneider at Catecinem has an excellent discussion of the value of unlikable protagonists in certain stories. The problem here is that I dislike characters that Valente wants me to like. Immortal, bizarre, and wonderful, the Pentexorans are supposed to represent an ideal outlook towards life. They are not intended to be perfect themselves, but to be as perfect as flawed creatures can be. Yet their hypocrisy is astounding. They lecture John angrily on love and tolerance, yet are smug, condescending, and arrogant towards him and all Christian ideas. They believe their society to be the epitome of Goodness and Naturalness, yet—because of a ritual that causes them to reshuffle their lives ever century or so, as an antidote for the monotony of immortality—they are forced to frequently break the natural ties of family and friends. Because of these issues, I was unable to connect emotionally with any of them, although I remained interested in their lives. I admit that it is difficult to explain my complaints against the book in a review that should be kept to no more than a handful of pages. The book’s plot and themes are complex and best explained in its own words. Much of what I dislike are the final implications of many layers of world-building that Valente has built up, and for you to quite understand what I mean would necessitate me explaining all her worldbuilding, which I have neither the time nor energy to do. But perhaps I can comment on the world-building, but as a way of speaking more positively about this book. See, what I do love is how Valente is just bursting with stories to tell. She is not satisfied with four interlacing tales, no; she fills every corner and crevice of the pages with stories. Little ones, big ones, some dealing with the mundane life of Pentexorans, some with extravagant myths, all of them striking in imagery and soaked in atmosphere. The Ship of Bones traveling over the sea of sand, by which the first fantastic creatures of a civilized nature arrived in Pentexore to settle it. Trips to the Fountain of Youth, where a goose-headed old woman serves immortality from a pool of sludge on the side of a mountain. How the Phoenixes died in their great forest to leave only one behind. How Alexander the Great entered the hidden land and built a wall of diamonds to shut in the evil giants Gog and Magog, and then left to continue his conquests of humanity. How a squat creature named Astolfo makes a living brewing potions and inks in his great mouth, while his wife, Hagia, tends the trees on which books grow. Hundreds of stories are told this way. There is a certain thrill from realizing the easy magic of this world. So there we have it, in as best a summary as I can manage now. The Habitation of the Blessed is composed with great skill and passion, overflowing with a generous love of words and the art of storytelling. It is ruined, in my opinion, by the prejudices of its author and her poor philosophy. I disliked this book because its worldview was opposed to my own. If you can read it and not feel attacked or belittled, then you will probably enjoy it much more.